50+ years of experience bringing relief to small businesses, families and individuals. Don't let bankruptcy define you. Call today for a FREE consultation. Principal Office Located in Hurst, Texas Ebert Law Offices P.C. 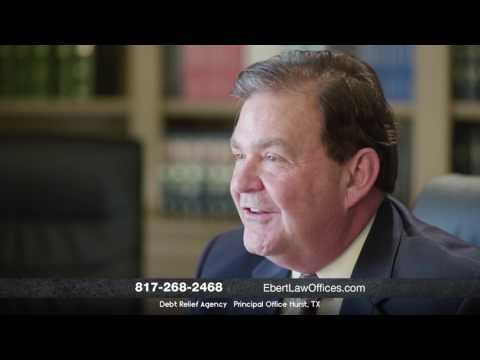 About Ebert Law Offices P.C. Thank you so very much for coming to our site. After almost 50 years serving the financial needs of Tarrant County residents, we decided to sell our firm to Vida Law. Like us, Vida is a highly respected, family-owned law firm located less than five miles from our offices. The decision to sell Ebert Law did not come easily, nor were we hasty in deciding the firm we wanted to sell to. We chose Vida because their business and personal principles are very much in line with our own, so we know they will take care of our clients as we have for the past five decades. Here’s a link to the Vida site, or if you wish to call them their number is (817) 358-9977.